REGISTRATION DEADLINE has been EXTENDED to NOON on SATURDAY, Dec 15th! All registrations must be submitted by that time. Register for Adventures in Learning 2019! Check out descriptions of this year’s classes HERE! When you’re ready, click here to register! Program Assistant Alexia Barandarian ([email protected]) is also happy to answer questions and provide support! Adventures in Learning (AIL) is a program of the Center for Learning in Action at Williams College supported by the Williamstown Elementary School (WES) and the WES PTO. It offers a variety of exciting and challenging after-school courses for students Grades 1-6. Classes meet once a week after school for up to four weeks, January 3-25th. Exceptions can sometimes be made to grade-level restrictions-- contact Melody with questions. Adventures in Learning 2019 Brochure (PDF). Volunteer instructors are Williams College students and occasionally members of the WES community. They are experienced, motivated, and enjoy working with children. All instructors have undergone a CORI check. AIL coordinators will serve as daily supervisors. Assist in scheduling your class so it doesn’t conflict with winter study course. Be part of a team. Each course is required to have two instructors. Be willing to discipline. Remember it is part of your job to keep students focused and energized. Feel free to bring questions and concerns to orientation meetings or contact program director Melody Fisher at 413-663-4741 or [email protected], or program assistant Alexia Barandarian ([email protected]). Thur/Fri classes meet for four consecutive weeks; Tues/Wed classes meet for three consecutive weeks (because Winter Study begins on a Thursday). AiL class proposals are closed for this year. Thank you! You are welcome to contact Melody Fisher at 413-663-4741 or [email protected], or Alexia Barandarian ( [email protected]). In the spring of 1994, Anne Hogeland and Elizabeth St. Clair, both graduates of Williams College who live in Williamstown and who had children in the elementary school, began to discuss ways to forge links between “town and gown.” At about the same time, the college began to explore ways to make more explicit connections between Williams and the local schools. Prior to Adventures in Learning, a number of college students were assisting teachers during the school day. What was missing was an opportunity for the students to create their own courses and to share their particular strengths and talents with children. Adventures in Learning fills that need and encourages learning for the sheer pleasure of it, without reference to grades or performance standards. Adventures in Learning has been a success from its inception, with an average of 20 courses offered each year. For the past three years, some 45-50 instructors and approximately 100 students annually have participated in Adventures in Learning. Since 2014 the program has been formally tied to the Center for Learning in Action. If a course is over-enrolled, students will be selected by lottery. Classes are small, so please include alternate choices whenever possible. Courses with insufficient enrollment may be cancelled. Exceptions can be made to age groups. Please contact Melody at 413-663-4741 or [email protected] if your child is interested in a class but is not the right grade. Registration for WES students is OPEN!!! The deadline has been extended to NOON on SATURDAY (Dec 15th). Be sure your registration is submitted by that time! Grades 2-3 Class maximum: 6 If you love to draw, paint, color, cut and paste, this is the course for you! But this isn’t your everyday coloring with crayons and markers. You’ll work with watercolors and acrylic paints, make collages, learn drawing skills and play games with color. Have fun and let your creativity go wild! Grades 4-5 Class maximum: 8 You already know that art is different all over the world, but here’s your chance to learn about some different cultures while you try your hand at a variety of art forms. Your explorations will include making African tribal masks, Native American corn dolls and dream catchers, Chinese fans and dragon streamers, Japanese origami, Hawaiian leis, Australian didgeridoos and Mexican god’s eyes. Grades 2-3 Class maximum: 8 Chinese Lanterns! Egyptian Mummies! African Masks! Mexican Pottery! Take a trip around the world without ever leaving home and try out some very different art projects that will really tap into your creative talents. Grades 4-6 Class maximum: 10 If you love to paint, draw and create all kinds of art, here’s a chance to explore your talent in some different ways. Use a variety of materials like chalk and charcoal, sculpey clay and acrylic paints to develop your skills and creativity. We’ll plan a field trip to a local museum as well, guided by the interests of the class. Grades 4-6 Class maximum: 6 Even if you love to work with your hands, you might not have tried this popular craft. You’ll learn a new stitch each week and will create a simple sampler that may inspire you to try more advanced designs. Have fun experimenting with different colors and patterns. Mrs. Engel has loved needlepoint since she was a child and wants kids to know it’s not boring! Mrs. Swoap is a former 3rd grade teacher. Grades 3-4 Class maximum: 8 Are you and your friends inseparable? Show them the strength of the bond by making them a friendship bracelet to decorate their arm. In this class we’ll have tons of fun learning how to make friendship bracelets, beaded ornaments, and other projects. Grades 2-4 Class maximum: 10 Explore the fun, practical and creative possibilities of combining art, math and design. Projects might include creating “math art” with string and cardboard, designing and making a house with cookies and candy, building bridges with Popsicle sticks, and more. You may also take an occasional outing to observe mathematical patterns in nature. Grades 3-4 Class maximum: 8 Here’s an unusual opportunity for you to explore the world around you by taking pictures of it. You’ll learn how to take an interesting photograph, whether the subject is people (including yourself! ), objects in nature, or some of your favorite things. You’ll create a journal of your photographs that will include writing about them and about yourself. There will be “homework” for this course — taking pictures some weeks for your next class. Grades 4-5 Class maximum: 8 Do you like presents? Do you like making your own presents? Learn how to use colorful string and yarn to make beautiful decorations and/or gifts. After learning some basic weaving techniques, you’ll be able to surprise friends and family with Mexican God’s eyes, tapestries, and friendship bracelets. Grades 5-6 Class maximum: 10 If you love making art, this is the class for you. You’ll have plenty of time each week to explore different techniques, including pointillism, collage, and abstract art, as well as working in styles from Latin America and Australia. Using many kinds of materials, you’ll be able to give your creativity full rein. Grades 2-3 Class maximum: 10 If you love painting, this is the class for you, because murals are really big paintings! You’ll work together to create the inside of a house, paint a night sky, make a 3D collage of a tidal pool and other great projects, all on a grand scale. Make sure you have a smock, the bigger the better! Irena and Kimberly painted murals at their high schools and love art. Grades 3-4 Class maximum: 10 Explore your creativity in this arts and crafts course. We will do a new project each week and students will have a chance to display their work at the end. Projects include snowflake mobiles, beads and jewelry making, sock puppets, and dream catchers. Grades 4-5 Class maximum: 8 You’ve studied music, you’ve studied painting, but here’s a chance to combine these art forms and learn about their intertwined history. In each class, you’ll look at works of art and listen to music from different cultures and periods of history and then create your own masterpieces. There will probably be a field trip to the Clark or Williams College Museum of Art. A great way to expand your creative horizons! Grades 3-5 Class maximum: 8 Everyone loves mobiles, and in this class you’ll combine an amazing variety of materials to create wonderful mobiles of all different shapes and sizes. Your imagination is the only limit! Veronica is returning to AIL for her second year; both she and Susan love arts and crafts and working with kids. Grades 4-5 Class maximum: 6 Students will learn the basic folds and figures of origami, and gain an appreciation of the history, beauty, and versatility of this ancient art. Students will construct their own original origami projects and figures. Grades 4-6 Class maximum: 8 A repeat of last year’s very popular course! Learn the basics of quilting and work together to make a baby quilt to be donated to Bay State Hospital. Due to intense interest in this course, only students who haven’t taken it will be considered. Students are welcome to bring an adult with them to help out and learn along with them. Mrs. Lenhoff is an experienced quilter and a great teacher. Grades 3-4 Class maximum: 8 Puppets are fun to watch, fun to make and fun to play with — you’ll get a chance to do all three in this class. You’ll use many different materials to create several types of puppets and background screens and the class will work together to create a performance with them. Maya and Susan have made many puppets themselves and love to work with children. Grades 2-4 Class maximum: 10 If you love pictures and stories, this course is for you. You’ll work with different materials to create a scrapbook full of your favorite things — drawings, poems, collages, — anything you want! Write a story starring you and your friends, create a funky self-portrait, add favorite photos from home (and take some in class), copy a poem you love or write your own — the possibilities are endless! Grades 3-6 Class maximum: 12 Weavettes are nifty little looms that were popular with kids years ago. You’ll learn how to use these these hand-held looms to weave squares in different patterns. Then we’ll sew the squares together to create scarves, pouches — all sorts of projects. Work at your own pace — this class is open to experienced and brand-new weavers. There will be one field trip to Mrs. Conforti’s house to try out her five other looms. Once you get started, you won’t want to stop! Grades 3-4 Class maximum: 10 Take a gourmet trip around the world as you learn about several different countries, including Japan, Israel, Italy and Mexico. Each class will include a fun project and a dish that reflects the unique character of its country of origin. This class is taught at Hopkins Hall — after meeting in the cafeteria, students will walk there with the instructors. Grades 5-6 Class maximum: 6 “Basta” means “enough,” but who ever gets enough pasta? This different kind of cooking class takes you through the preparation of an entire Italian meal: Antipasti (appetizer), Primi Piatti (first course), Secondi Piatti (second course), Contorni (side dish) and Dolci (dessert). Students will travel to a kitchen on the Williams campus and return to WPS for pick-up. Grades 5-6 Class maximum: 10 For adventurous eaters only! You’ll learn fun cooking techniques in this class while you create and sample dishes from Mexico, Asia, Italy, India and Greece. Students will meet in the cafeteria to be driven to Lambert House on Hoxsey St., where parents can pick them up after class. Grades 2-4 Class maximum: 8 You might already know a little Spanish (or a lot) or you might just be interested in learning some. Can you think of a more fun way to learn a language than through food? This course will introduce you to the language and culture of Spain while you make (and eat!) appetizers, main dishes and desserts. Grades 3-4 Class maximum: 8 Forget about Burger King and Friendly’s! Here’s your opportunity to expand your horizons and explore some kinds of food you might not be familiar with. Every week you’ll learn about a different part of the world and create some tasty treats from that region. Possible areas of exploration include Central and South America, Africa, the Middle East, India and Europe. Grades 4-5 Class maximum: 8 Explore different countries and cultures by making some of their native dishes! If you love to eat and want to learn how to cook some new and exciting dishes, this is the class for you! We will cook a meal from a different country each week and learn a little bit about the culture and some words from the language of five different countries: Italy, Korea, India, China, and Mexico. Buon appetito! Grades 5-6 Class maximum: 8 Dessert is everyone’s favorite part of the meal, and this course focuses on goodies from all over the world! Every week you’ll learn about a different country and make a sweet treat such as baklava (Greece), jellabis (India), natilla (Venezuela) or cannolis (Italy). Better yet, you get to eat them! Grades 2-3 Class maximum: 6 Pasta as an art form? Tim thinks so — he’s from a family of chefs and wants to share their pasta secrets with you. You’ll make pasta from scratch (and even from potatoes!) and then use pasta to do magic, create art, make faces. Of course, you’ll get to eat some, too. Better bring an apron or smock — this could get messy! Tim is an experienced pasta maker and camp counselor. Grades 2-3 Class maximum: 10 Tired of your parents telling you not to play with your food? Well, you’ll still have to mind your manners at home, but in this course, you can mess around all you want – you’ll be making art with food: fruit and veggie people, gingerbread houses, cookie sand art and re-creating famous paintings with unusual ingredients! Grades 5-6 Class maximum: 8 Trying new foods is one of the great opportunities of travel – here’s your chance to sample the gastronomic delights of the world without leaving town. Explore the culture and cuisine of Mexico, Germany, Japan, Africa and China. This course will meet at a kitchen on the Williams campus; students will be transported to and from WPS. Grades 3-4 Class maximum: 8 Everyone loves to eat, but how often do you think about where your food comes from and where it goes? You’ll not only get to make some yummy food in this course, you’ll play food games, draw food pictures and visit Caretaker Farm to learn about farming and composting. Plus, you’ll plan and prepare a final dinner for your families at the Open House. Grades 4-6 Class maximum: 12 Everyone loves to eat – wouldn’t you love to cook, too? You’ll learn basic techniques of mixing, measuring and making meals, with a different focus each week: finger foods, breakfast treats, dinner feasts and of course, fabulous desserts! Classes will be held in kitchens on campus, with small groups and plenty of supervision. Grades 4-6 Class maximum: 6 What could be better than going around the world on your stomach? Each week, explore the cuisine of a different country, including Poland, India, Ireland and others. Learn basic baking and kitchen skills as well as the history and culture of some fascinating countries. Don’t forget to bring some goodies home to your family! Anne taught AIL last year, and both instructors love to cook. Grades 4-6 Class maximum: 10 Use your imagination and creative energy to the fullest in this class which explores the art of acting and improvisation. You’ll play theater games and exercises, work on scenes and characters, and rehearse a final performance for the Open House. Grades 4-6 Class maximum: 8 Learn all about the mechanics of performance with an emphasis on improvisation and collaborative exercises. Work with the group to choose and interpret a text, develop basic acting skills, figure out how to stage a production and put on a simple show. Both instructors have years of performance experience. Grades 2-4 Class maximum: 10 Stretch your imagination . . . let your creativity soar . . . get really silly! This course will engage your mind, body and personality as you create impromptu skits, learn fun improvisation techniques and games and even do some mime. The instructors are experienced thespians with tutoring and camp counseling backgrounds. Grades 3-4 Class maximum: 10 Here’s your chance to create a show from the start ≠ write a script based on improvisations, develop the characters through theatre games, and learn how to bring the whole performance together, including sets, props and costumes. You get to be the actors, directors, and producers all at once! Grades 2-3 Class maximum: 10 An introduction to the fun and educational world of music! Do you like music? Have you thought about playing a musical instrument or do you already play? Do you want to learn cool things about all types of music? This class will introduce the amazing world of music through exciting activities with instruments, rhythms, notes, composers, and tons of other fun things. (There might even be some hands-on time with real instruments.) If you’ve played music for years or if you’ve never even seen a piano, as long as you’re MAD ABOUT MUSIC!, sign up so see all the great things you can learn. Grades 2-4 Class maximum: 8 Stories can be explored in many ways – reading them, acting them out, making them up, improvising characters. In this course, you’ll try all these methods and maybe make up some new ones! You’ll create your own stories to perform for parents and friends at the end of the program. The instructors have experience with art and theatre and have done lots of teaching and babysitting. Come get yourself in a theatrical mode before the spring performances at WES! Solo performance is a style that is frantic, outlandish, and outrageously fun. It’s the art of taking one body and jamming it full to bursting with the multiple minds, voices and hearts of uniquely different characters. In this class we will explore the possibility of playing a villain, hero and sidekick all at once, and having a huge amount of fun experimenting with improvisation and creative play. We will work on timing, body language, voice and the many other cues that help a spectator follow a conversation between imaginary characters like a robot and a tin can, or a lion and a mouse. With no props and no stage, we can go as far as our imagination pushes us. Grades 3-4 Class maximum: 10 How do all those instruments in an orchestra work together to make beautiful music? What is the conductor doing up there with that baton? Whether you already play an instrument or not, this is a great way to learn about all kinds of instruments and music. You’ll play string, percussion, wind and brass instruments and hear orchestral music written especially for children, and maybe do a little composing on your own. Grades 3-6 Class maximum: 12 Lights, camera action! This fun course is back with the same group of experienced instructors who’ll introduce you to some basic acting, singing and dancing skills and then help you stage a short musical production at the end of the program. If you’ve always dreamed of being on stage, this is your chance! Class meets twice a week. Grades 4-6 Class maximum: 10 This course differs from Musical Mania in that you’ll write, design and produce an original musical theater piece. Learn theater games, tour the Adams Memorial Theater, brainstorm on script ideas, create costumes – you’ll be involved in all aspects of a show. Michael and Emmy are theater majors with plenty of experience directing, composing and acting. Grades 2-3 Class maximum: 8 A different approach to theatrical performance, this course is based on a book called Reader’s Theatre. The class will break into smaller groups to read a play and make simple costumes. The groups will perform for each other, with a final performance taking place for parents and friends. Work on your reading skills while exercising your imagination and having fun. The instructors are familiar with this course and have taught at summer camps. Grades 4-6 Class maximum: 8 This is an unusual opportunity to learn not American Sign Language, but actual signed English. After you pick up the alphabet and learn name signs, you’ll work on songs for a final performance, signing along with music. This course is very popular at the summer camp where Meredith has worked for the past four years. In this class we will learn the basics of singing technique, like breathing and posture. We’ll learn some Kodaly method, a really neat way of teaching/learning music. We’ll also learn a little about rhythm and reading sheet music. Mostly, though, we’ll just sing fun songs! We’ll concentrate on classical music from all time periods, some with piano and some without, and learn how to harmonize and make beautiful music with our voices. All voices welcome! Grades 2-3, 4-6 Class maximum: 12 Simon says clap your hands, Simon says stomp your feet, Simon says a little LOUDER please! If you can do what Simon says, then this course is definitely for you. Steppin’ Up is an introduction to a fresh form of movement known as STEP. STEP is based on African-American dance and music styles involving stomping of the feet, clapping of the hands, and using different parts of your body as a musical instrument to make sounds, rhythms, and beats that everyone can enjoy. If you like to dance, perform, and have a good time while breaking a sweat, step up and show Simon what real stepping is all about. Children should wear gym clothes and sneakers and bring a bottle of water. Grades 4-5 Class maximum: 10 Create a performance from your favorite stories and bring them to life on stage. You’ll learn some fun vocal and acting warm-up exercises, do some writing and editing, develop characters and dialogue, and do lots of acting. Grades 2-3 Class maximum: 10 A fun and interactive way for children to learn more about theatre — no experience necessary. Children’s imaginations flourish with the use of props and improvisational skill. The emphasis is on imagination and fun! Children will have the opportunity to perfom their own pieces in the last week of class. Grades 2-6 Class maximum: 12 The Ephlats are popular performers at WPS, and here’s your chance to learn how to sing like them. “A capella” means singing without instruments – you’ll have fun using your voice as the only music and learning to harmonize with a group. You’ll also sing with piano and guitar accompaniment. Some previous singing experience would be helpful, but isn’t necessary. Charley and Mary-Jane are currently members of the Ephlats. Ms. Swann, an accomplished singer, has experience performing and working with children. Grades 4-6 Class maximum: 8 Trip the light fantastic in this course which explores the properties of light and sight. You’ll also learn about optical illusions in life and art. Lots of hands-on experiments and projects will having you doing double-takes and thinking you’re seeing things. There may be a field trip to MassMOCA, too. Grades 2-3 Class maximum: 10 With a focus on the incredible animals of the Amazon, you’ll learn about the rain forest from their firsthand experience and use your new knowledge to create some wonderful masks and sculptures. The final project will involve creating a life-size Amazon scene and exploring it for signs of animals. Grades 2-4 Class maximum: 8 In this course, you’ll learn about a few of the many animals that live in the Berkshires, some even in our backyards! The focus will be on snakes, turtles, and common mammals (there may even be some live visitors). You’ll create a nature journal, explore some of the areas near us where animals live, and learn a lot about a few of our “neighbors.”BONKERS FOR BIOLOGYGrades 5-6 Class maximum: 10 Germs, DNA, volcanic explosions, plant tricks, dense solutions, all kinds of cool stuff are explored in this class. Plenty of hands-on experiments in a fun environment. Grades 5-6 Class maximum: 10 This course will serve as an introduction to object-oriented computer programming. We will use the KAREL++ programming by presenting material through a graphical interface. Students will learn to program Karel, an on-screen robot, to work and perform tasks. This course will take place on the Williams College campus. Grades 2-3 Class maximum: 8 Everybody likes to mess around with goop and glop! In this class, you’ll make great projects like silly putty, rock candy, and (everyone’s favorite) volcanic explosions! If you’re lucky, your parents may let you try some of this neat stuff at home (but only if you promise to clean up). Grades 2-4 Class maximum: 6 Explore the fun, practical and creative possibilities of combing art, math and design. You’ll create “math art” shapes with string and cardboard, design blueprints for a house, build bridges with popsicle sticks, and more. You’ll also take occasional outing to observe mathematical patterns in nature. Grades 5-6 Class maximum: 5 If you want to learn about the internet and specifically would like to create your own homepage, you should sign up for this course. You’ll learn about creating text and lists, making hyperlinks, scanning images and other important computer skills. Grades 2-3 Class maximum: 8 You probably already know a lot about the environment, but this course will expand your horizons. You’ll contemplate marine life, investigate the insect world, wonder about the weather and get into garbage. Highlights include live animal visitors and a field trip to the dump, of all places (you wouldn’t believe how many animals live out there!). Grades 3-5 Class maximum: 8 Everyone knows about recycling and littering, but what does pollution look like up close? Really close, like under a microscope? How can you tell clean water from dirty water? What actually happens when you make compost? Explore these and many other important science questions through a variety of hands-on experiments and explorations. Grades 4-5 Class maximum: 8-10 Ever wonder how things float in water? How candy is made? How buildings stand? Every week you’ll make exciting scientific discoveries that will have you saying “Eureka!” You’ll build aluminum foil boats and spaghetti towers, make sugar crystals, and drop an egg without breaking it, in this series of fun science experiments. Grades 4-6 Class maximum: 8 Have you ever baked a cake and it came out as you thought it would, or it came out all wrong? Have you ever tried an experiment and the results completely surprised you? In this class you will create a scientific hypothesis and conduct experiments to test the hypothesis, to see whether your predictions were correct or incorrect. At the conclusion of the program you will present the results of your work. Who knows, maybe you will can become a genius! Explore our very own galaxy, the Milky Way! Through activities of all kinds, we will learn about what a galaxy is, what ours is like, and where our solar system is within it. We’ll talk about the stars that make up the galaxy: how they are different from each other, how they “live” their lives, and why they look the way they do here on Earth. We’ll discuss fascinating denizens of deep space from nebulae to black holes to other solar systems. Finally, we’ll learn a little about galaxies beyond our own! Grades 2-4 Class maximum: 10 If you’re dying for a pet of your own or want to learn more about the pets you already have, here’s your chance. You’ll meet a variety of creatures, from rodents to reptiles and from Fido and Fluffy to some feathered friends. We’ll work on a different animal art project each week if time permits. One week we will travel to the animal hospital for a behind-the-scenes look at veterinary care. Grades 3-4 Class maximum: 8 Nancy Drew and Hardy Boys fans, here’s a chance to follow in your idols’ footsteps. Identifying clues, analyzing fibers and fingerprints, investigating the scene of the crime – you’ll learn basic forensic techniques used to solve crimes and then try to solve one yourself. Dafina taught a science class for AIL last year. Grades 2-4 Class maximum: 10 Volcanoes, goop, weird concoctions and plenty of opportunity to make a mess – what could be more fun? This hands-on approach to science is always popular. Grades 2-4 Class maximum: 10 What’s more fun than learning about bugs? Creating one of your own to take home! In this course, you’ll learn about life in streams and the bugs, big and little, that inhabit them. You’ll get to mess around in buckets of water (with various things hiding in them!) and may have a field trip to the river, if it’s not too cold. Plus, a special guest at the end will show you how to use bugs to fool fish. Grades 2-4 Class maximum: 8 You probably know a little about whales already, but here’s your chance to really explore the world of these wonderful creatures with someone who’s just spent a few weeks in Bermuda studying them. Starting with what you’ve already learned, you’ll read stories, follow up ideas that interest you (the history of whaling, the life cycle of the killer whale — you name it!) and come up with a final project to work on together. Grades 3-4 Class maximum: 10 You’ve written stories before, you’ve drawn lots of pictures, you’ve read all kinds of books, but have you ever made a book of your own from the very beginning? You’ll start by making the paper, then do all the writing, editing, illustrating and putting together. This could be the start of a great writing career or the development of a lifelong enjoyment of the great world of books. Grades 3-4 Class maximum: 8 Chinese brush painting, rice paper, and dumplings are a few of the many new experiences this exciting course offers. Learn how to use a Chinese yo-yo! You’ll see, taste, and hear all about the Chinese New Year and other festivals, learn to write your Chinese name, play some new games, and much, much more. Take a trip to China each week without ever leaving home. Grades 2-3 Class maximum: 15 Dear Diary, During our time together, we’ll design and decorate our own personal journals. We’ll then spend time writing and reflecting on a variety of subjects each week. We will record our deepest thoughts, daily developments, and dreams for the future! This book will be for our thoughts only. Grades 2-3 Class maximum: 8 Create a storybook of your own poems and pictures based on color themes. Explore the world “with rose-colored glasses,” create some “purple prose,” and think about how colors have so many different meanings and emotions associated with them. Both instructors are English majors who love creative writing and art. Grades 5-6 Class maximum: 8 Your imagination creates some of the most interesting characters, from a three-headed monster to a girl who cries flowers. Reading and creating short fantasy stories opens doors to a world where you are in control. Just like J.K. Rowling created Harry Potter and his world and J.R.R. Tolkien came up with Middle Earth and hobbits, you too can explore the unbelievable. Discover where your imagination can lead you! Grades 4-5 Class maximum: 10 Get the scoop on how to construct a newspaper, from investigating stories to writing and editing them to layout and format. Grades 4-5 Class maximum: 10 Jousts! Armor! Feats of daring! The legends of King Arthur and his noble knights have fascinated generations of storytellers and their listeners. In this class, you’ll enjoy these ancient stories and then create your own legend, complete with dragons, if you like. Josh and Jon love mythology and legends; they taught a course on Star Wars last year. Grades 2-3 Class maximum: 8 If you love stories, this is the course for you! You’ll learn about storytelling traditions from around the world, including Greek myths, Native American folklore, tales from India and Japan. See how stories from many different places have common themes and characters and have fun with a different craft project each week. Grades 5-6 Class maximum: 10 Poetry is a wonderful way to express yourself, and there are so many different kinds of poems. If you like to write, this is a chance to explore some new forms of creativity: acrostic poems, haiku, shape and color poems, blessing/curse poems and many more! You’ll work alone and in groups and share your work with the rest of the class – just like a professional writer’s workshop! Grades 2-4 Class maximum: 6 Explore the world through poetry – you’ll look at nature, talk about people, listen to music, and take a trip to the Clark to see some paintings. Then you’ll use those experiences to write poems both by yourself and as a group. The final project will be a book of the class work, with copies for each student and one going to the school library. Grades 5-6 Class maximum: 10 Hola! Welcome to the wonderful Spanish language and culture! Learn common expressions and useful vocabulary. Learn about the cultures of Spain and Latin America. All while having fun! Play a game, listen to Spanish music, and work with your classmates. A great class for students who have little to no experience with the spanish language, but have a huge interest! Come on! Let’s make Spanish fun! Grades 2-4 Class maximum: 10 Who’s the most interesting person you know? Why, yourself, of course! It’s never too early to start recording your life, and here’s your chance to create a whole book just about you – with great ideas for artwork and a special scrapbook section. When you’re rich and famous, this book could be an important resource for your biographer! Grades 3-4 Class maximum: 6 Poetry can be a blast, as lovers of Dr. Suess and Shel Silverstein know. You’ll enjoy the poetry of these great writers, as well as other favorites like Ogden Nash and Rudyard Kipling. And you’ll create your own masterpieces, inspired by ordinary objects, silly subjects, and outside explorations. There will be a field trip to the Clark or Williams College Museum of Art, where you might get a whole new perspective on art. Grades 5-6 Class maximum: 8-10 Have you always wanted to say more than “Bonjour” in French? Do you know where in the world people say “Bonjour”? Learn a little bit about the people of the diverse cities, deserts, fields, and oceans where French is spoken while learning to speak some French yourself! There will be pictures and stories from both instructors, who have traveled and lived with French-speaking people all over hte world, as well as language lessons and an introduction to a few cultural traditions — including some tasty ones! Grades 3-4 Class maximum: 8 Do you dream of writing the Great American Novel or a scholarly book on your favorite subject? You can do it in this course, where you’ll research topics at the library and on the computer, and then write, design and produce an actual book. Heather and Julie enjoy working with kids and do a lot of writing themselves. Taking advantage of the winter weather! Grades 5-6 Class maximum: 16 Learn the basics and have fun playing chess. We will explore historic chess games, learn strategies and tactics to create an advantage, and record and analyze our games to learn from them. Grades 4-6 Class maximum: 10 Learn the basics of this ancient game, based on the movements of warriors and kings. You’ll have lots of time to actually play, as well as learning strategies and watching experienced players. Chris and Rebecca look forward to sharing their love of chess. Grades 5-6 Class maximum: 10 Football fanatics, here’s your chance to extend the season. Join experienced coaches and players to learn more about this great game, from chalk talks to the details of the playbook to critiquing game tapes. Weather and space permitting, you’ll get to toss the pigskin around and run some plays yourself. Grades 2-4 Class maximum: 15 Soccer to us is FOOTBALL to the rest of the world. Our goal is to work on our basic football skills and then move on to more refined skills as dribbling and shooting, being aware of positions on the football and our responsibilities. We will be exposed to various football playing styles such as that of Brazil, Germany, England, and the USA. Of course, we will play games every week and use the skills we have just mastered. Having a pair of sneakers is important as we will be playing in the gym. Grades 3-4 Class maximum: 8 If you like games and you want to learn more about them, this course is for you! In the first three classes we will explore three different types of games and strategies for playing them — card games (UNO, rummy, and spit), race games (Sorry!, Trouble, and Candyland), and family games (Clue, Life, and Monopoly Jr.). We will also introduce you to stories of games through history. Finally, using our new knowledge, we will create games of our own. Did you know that the oldest game, the Royal Game of Er, dates beack to 2500 years BC? If you want to know more, take Games Galore! Grades 5-6 Class maximum: 12 Why are some games so much fun while others are just kind of dull? In this unique class, you’ll play a bunch of different games and try to figure out what makes them tick — games of strategy and manipulation, card games, all kinds! You’ll develop ways to improve mediocre games and make them more fun and creative. Some of your suggestions might be sent to the manufacturers to see if they respond. Grades 5-6 Class maximum: 10 Do you like to play games? Figure out cool ways to solve problems? Puzzle your friends? In this course you will explore crazy paradoxes, games, optical illusions, logic puzzles, and much more! 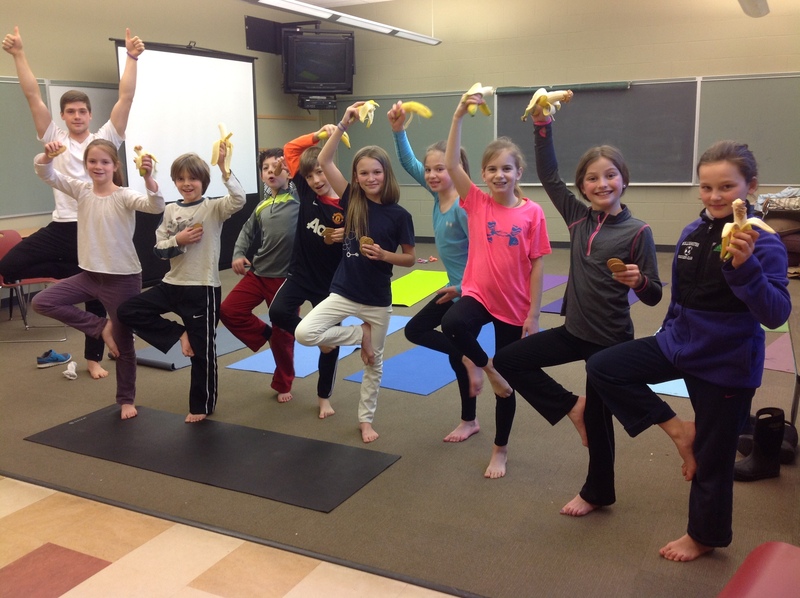 Grades 4-6 Class maximum: 8 Proud Warrior, Child’s Pose, Downward Dog — what in the world do these terms mean? In this class, you’ll learn some basic yoga techniques and positions. Yoga is very popular these days, and for good reason — it’s fun, it’s relaxing, and it’s good for your body and mind! Participants should wear loose, comfortable clothing (jeans not recommended!) Mats will be provided. ADVENTURES IN AFRICAGrades 2-4 Class maximum: 8 Jambo! If you thought you learned a lot about Africa from The Lion King, think again . . . here’s your chance to explore a fascinating country filled with amazing animals, fabulous dancing and music, wonderful stories and legends, and incredibly varied geography. You’ll try it all, and construct a jungle to boot!ADVENTURES IN AFRICAGrades 3-4 Class maximum: 8-10 Venture into East Africa with a former Peace Corps volunteer to learn about this fascinating region. Explore the geography, go on a safari, try native crafts and games, learn the basics of Kiswahili and meet people from our community who grew up in Africa. There will be a new snack to try each week, as well!ADVENTURES IN INDIAGrades 2-3 Class maximum: 6 Exotic India beckons! Experience the variety and vast scope of this amazing country: Try on a sari or turban! Cook some favorite Indian snacks! Play a traditional tabla! Hear wonderful stories!AROUND THE WORLD IN JUST 5 DAYSGrades 4-5 Class maximum: 10 Sign up for a smorgasbord of stories, a festival of fun and a twirl of travel! You’ll learn about a lot of different places: Asia, India, Africa, Europe and South America; focusing on different crafts, customs and traditions in each.EXPERIENCE INDIA!Grades 2-4 Class maximum: 10 India is an amazing country, with an ancient history, many different peoples and languages, and a long tradition of fascinating songs, stories, and dance. In this class you’ll learn a whole lot about India. You’ll enjoy hands-on experiences like dressing up in traditional clothing, tasting Indian snacks, playing instruments and seeing an Indian film (Did you know that India produces more movies than any other country in the world?) FORT BUILDING!Grades 2-4 Class maximum: 6-8Let your imagination and creativity flow! This class introduces students to a wide range of fort-building techniques, from the classic pillow and sheet fort to more complex structures like the tunnel-box fort and even the snow fort (weather permitting)! Each class will include games, fort construction/decoration time, and potential in-fort snack and reading time. Once constructed, students can look forward to some story time in the forts as well as imaginative play, turning the fort into whatever they want (e.g. : an intergalactic battleship, a submarine, a medieval castle).GIRL POWERGrades 3-4 Class Size Max: 8 What does it mean to be a girl? In this class we will discuss topics such as: what does it mean to be “pretty”? Who are our favorite girl characters in stories? Why do girls sometimes say mean things about their friends? We will draw, sing, write, and reflect on our lives as girls, building bonds and sharing friendship and empowerment. Expect to be creative, expressive and have fun!THE GREAT DEBATE: FUN WITH PHILOSOPHYGrades 5-6 Class maximum: 10 People have been asking themselves the same questions for thousands of years: What is justice? How do we become moral people? How should we behave to one another? What should we expect from our government? And for thousands of years, philosophers have tried to answer these questions. In this course, you’ll learn some of the fundamental principles of philosophy (but not through boring lectures!) With skits, art projects and the basic methods of debating, you’ll really be a part of the discussion. The last class will consist of a real debate on a topic selected by the class.IF THE CATS ARE GREEN . . . (LOGICALLY SPEAKING)Grades 5-6 Class maximum: 10 If the cats are green, then will the violin write a poem? Find out in this challenging but rewarding class, which introduces students to the excruciatingly delightful pursuit of logic. Games and puzzles are mixed with formal theory, and the instructor promises “huge globs of oversized fun!” This is a pretty rigorous course, so you should be motivated to really use your brain.THE MYTHOLOGY OF STAR WARSGrades 4-6 Class maximum: 8 Centuries of mythic tradition can be explored in the well-known Star Wars trilogy. See how these popular movies (which may seem ancient to you!) encompass a variety of different myths, legends and traditions. Play Star Wars “Jeopardy” and create your own version of a great myth. Both instructors have worked with kids and know a lot about Star Wars and classical mythology.OLD-FASHIONED EXPERIENCESGrades 2-3 Class maximum: 10 Do you love reading about how people lived in “olden times?” Are you fascinated by places like Williamsburg or Sturbridge Village? Here’s your chance to go back in the past and learn some skills that are still worth knowing today, like knitting and sewing, baking, and candle-making.OUT OF THIS WORLDGrades 4-5 Class maximum: 10 UFOs . . . the Bermuda Triangle . . . ESP . . . the Lochness Monster. The world is full of mysteries that intrigue, frustrate and even frighten us. Explore a variety of unsolved mysteries, examine the wonder and the skepticism that surround them and make up your own mind.PASSPORT TO ADVENTURE – AROUND THE WORLD IN A FEW DAYSGrades 3-5 Class maximum: 8 It’s hard to travel much when you’re in school all the time, but here’s your chance to explore some places you might want to visit sometime. Possible destinations include China, Ghana, Mexico, Israel and India. You’ll create a personal passport/scrapbook full of souvenirs from your travels – pictures, stories, songs and music, calligraphy, new words and phrases. . . the world’s the limit! You’ll try some new snacks, too, but don’t put those in your scrapbooks!THAT’S DEBATABLE!Grades 5-6 Class maximum: 10 Pro or con – here’s your chance to take a stand and really have people listen to you. This course will teach you to think fast and speak clearly on any subject. You’ll watch college debaters in action and learn to brainstorm and prepare an argument for either side of an issue. The finale will be a full-fledged debate on a topic chosen through brainstorming sessions.